This splitter cable is for splitting 1 HDMI signal to 2 HDMI. NOTE: It is STRONGLY recommended NOT to use this passive splitter with longer lengths of HDMI cables. Also, since passive splitters do not negotiate individual handshakes between connected devices and do not pass HDCP information back to the source device, passive splitters are not recommended for most home theater applications. For home theater applications, using an active or powered splitter is highly recommended. 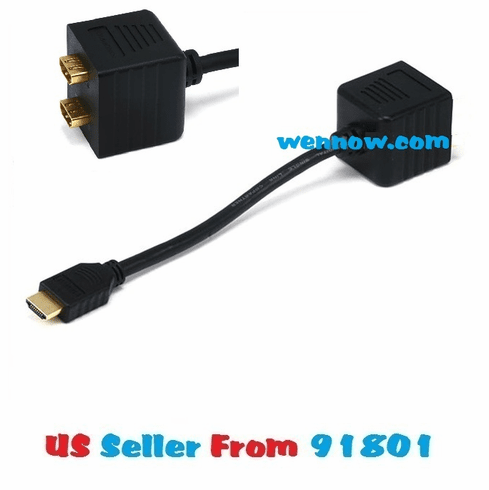 (*) This is a splitter cable. You can only connect one source device (i.e. DVD player, cable box or satellite receiver) to two output devices (i.e. TV or projector). You can't connect two source devices (i.e. DVD player, cable box or satellite receiver) to one output device (i.e. TV or projector).